The BMW Z8 was a car produced by German automaker BMW from 2000 though 2003. It was given the E52 BMW model code. The Z8 was the production variant of the 1997 Z07 (seen above) concept car, which was designed by Henrik Fisker at BMW's DesignworksUSA in Southern California. The Z07 originally was designed as a styling exercise intended to evoke and celebrate the 1956-'59 BMW 507. The Z07 caused a sensation at the '97 Tokyo Auto Show. The overwhelming popularity of the concept spurred BMW's decision to produce a limited production model called the Z8. There were 5,703 Z8s built, approximately half of which were exported to the United States. The original Z07 had been designed with production in mind. As a result, practical and regulatory considerations necessitated very few changes for the production model. Nevertheless, the windshield of the Z8 was extended upward, and a larger front airdam was fitted. Both changes were implemented to provide aerodynamic stability and a reasonably placid cockpit environment. The four spoke steering wheel of the concept car was replaced by a three spoke design. The hardtop was changed from a double-bubble form with a tapering faring to a single dome with a truncated convex backside. The concept's exotic driver's side helmet fairing was eliminated to allow easy operation of the power soft top. Despite these changes, the Z8 remained extremely faithful to the concept car. The side-mounted turn indicators were integrated into the side vents in a fashion that rendered them invisible until activated. The vintage simplicity of the interior was preserved by hiding the modern equipment under retracting panels. Complex compound curves were preserved through the use of an expensive MIG-welded aluminum space frame. The Z8 even retained the concept's five spoke wheel design, albeit without the race-style center lug nut. The $128,000 car had an all aluminum chassis and body and used a 4.9 L (4941 cc) 32 valve V8, that developed 400 hp (294 kW) and 500 Nm (363 lb·ft) torque. This engine, known internally as the S62, was built by the BMW Motorsport subsidiary and was shared with the E39 M5. The engine was located behind the front axle in order to provide the car with 50/50 weight distribution. The factory claimed a 0 to 100 km/h (0 to 62.5 mph) time of 4.7 seconds; Motor Trend magazine achieved 0 to 60 mph (97 km/h) in 4.2 seconds. Road and Track measured the car's lateral grip at .92. Car and Driver magazine also tested the car and found that it outperformed the contemporary benchmark Ferrari 360 Modena in three important performance categories: acceleration, handling, and braking. As with most BMW products, its top speed was electronically limited to 155.4 mph (250 km/h); the car's maximum top speed with an unlocked chip was 186 mph (299 km/h). In order to keep the interior uncluttered, a number of convenience functions were integrated into multifunction controls. For example, the power windows and mirrors were controlled by a single instrument. Also, the center mounted instrument cluster was canted slightly toward the driver. The displacement of these gauges to the middle of the dash was intended to offer an unimpeded view of the hood and the road ahead. In order to promote the Z8 to collectors and reinforce media speculation about the Z8's "instant classic" potential, BMW promised that a 50 year stockpile of spare parts would be maintained in order to support the Z8 fleet. Due to the limited volume of Z8 production, all elements of the car were constructed or finished by hand, thereby compounding the importance of ongoing manufacturer support for the type. The price point and production process allowed BMW to offer custom options to interested buyers. A significant number of Z8s with nonstandard paint and interior treatments were produced over the course of the four year production run by BMW Individual, a division of BMW AG. 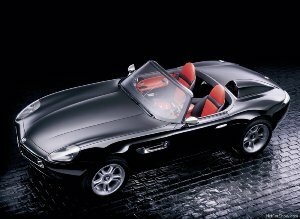 For 2003, the final model year, the Z8 model was augmented by the Alpina V8 Roadster. The Alpina was a departure from the hard-edged sporting focus of the original car, and elements of the new grand touring intent were evident throughout this final edition. Instead of the original six speed manual and 4.9 liter (S62) engine featured in earlier Z8's, the Alpina came only as an automatic, using a 5-speed BMW Steptronic transmission allied to a downgraded 4.8L Alpina-tuned V8 motor from the Alpina E39 B10 V8 S. In order to complete the car's transition from sportscar to boulevardier, relaxed suspension tuning was used. The standard Z8's run-flat tires and 18 inch wheels were discarded in favor of conventional tires with softer sidewalls, and 20 inch wheels. A new, softer grade of Nappa leather replaced the Z8's less supple specification, and special Alpina gauges were featured on the dash cluster. An Alpina steering wheel with three solid spokes replaced the original, which could not be retrofitted with shift paddles for the automatic. Gear selection was displayed in an Alpina-specific display mounted in front of the wheel. Performance of the Alpina Z8 differed from that of the standard car in that peak power was reduced to 375 hp (280 kW) while peak torque was raised to 383 lb·ft (519 N·m); this torque was available at significantly lower rpm than the original in order to enable more relaxed cruising. Curiously, the electronically limited top speed was officially raised to 161 mph (259 km/h). Only 555 of these Alpinas were built, most of which were exported to the United States market. In the United States, this special edition of the Z8 was sold directly through BMW dealerships, marking a first for Alpina, whose cars had never been sold through retail channels in the USA. The Z8 held BMW's production car performance records for several years, and many journalists praised the car, but some in the UK motoring press most notably Jeremy Clarkson, who while reviewing the Alpina edition of the Z8 on Top Gear (Series 2 Episode 3), described the standard Z8 as having terrible handling and being an example of a car that never knew what it was supposed to be, a supercar or a roadster. Reports that the front shock towers could deform from a severe pothole impact gained attention in early 2006. The very hard run flat tires are responsible for the problem. In response BMW AG engineered and released a strut tower brace kit to stabilize that area of the frame as part of the Performance Package by the end of the year. This information can be found on the web at Wikipedia.